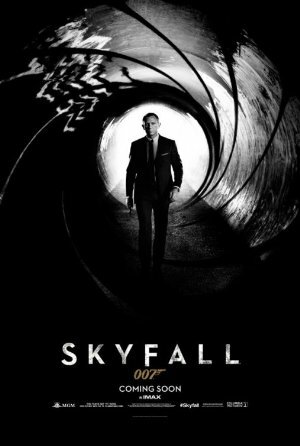 Skyfall is a James Bond film that was fifty years in the making and was well worth the wait. This is the best Bond film in the post-Sean Connery era, and may be the best ever period. The action is non-stop and even at two and one-half hours, the viewer will be on the edge of their seat the entire time. The film opens with Bond (Daniel Craig) on a mission pursuing a stolen computer hard drive that has a list of agents who are embedded inside terrorist organizations under deep cover. He is assisted in this task by “Eve” (Naomie Harris), also a field operative although not a ‘Double-OO’. Reaching a critical point in the pursuit, “M” (Judi Dench) orders Eve to shoot the thief while he is fighting Bond. She shoots, but hits Bond instead sending him to his “death”. But he comes back from the dead after a cyber-attack causes a massive explosion at MI6 headquarters. M is being blamed for the breach and her job is in jeopardy. In fact it looks like “Gareth Mallory” (Ralph Fiennes) will be replacing her. But she is determined not to leave her position until whoever is responsible for the attack is brought to justice. Eventually Bond manages to track down “Silva” (Javier Bardem), a former MI6 operative seeking vengeance on M for something that happened while he was working under her operative control at Station Hong Kong in the days before the island was returned to Chinese control. He is a master computer wizard and is using that skill in his scheme against MI6 and M. Opposing him on the other side of the cyber-warfare is a new “Q” (Ben Whishaw, and remember, Q is a code-letter for Quartermaster) and he’s pretty good with computers himself. This is by far the best turn as Bond that Craig has done and it is clearly a combination of his acting abilities (shown off in Layer Cake and The Girl With the Dragon Tattoo among others), superb writing and a damn fine job of directing. Bardem is equally brilliant as the villain Silva who is happy to match wits with Bond, Q, M or anyone else who comes along. Fiennes also provides an excellent addition to the group of characters that make up the ‘regulars’ in Bond films and he will undoubtedly appear again in “Bond 24” for which Craig is already under contract. As usual the scenery and backdrops are magnificent, with filming done on location in Turkey, China and Scotland. There is strong attention to details of the history of Bond, with homages to prior films. They even used the right last name for the MI6 Chief of Staff. Better still, the focus was on the story and the character arcs, rather than clever repartee or gadgets. Skyfall is a winner and should be seen on the largest screen available to be fully appreciated. Plot: Bond's loyalty to M is tested when her past comes back to haunt her. Whilst MI6 comes under attack, 007 must track down and destroy the threat, no matter how personal the cost.